Lately, I have been looking at my collection of images by theme, grouping Biblical and mythological subjects in categories. (It becomes helpful to have these groupings, which would normally not be seen in museums, when giving lectures or teaching children.) 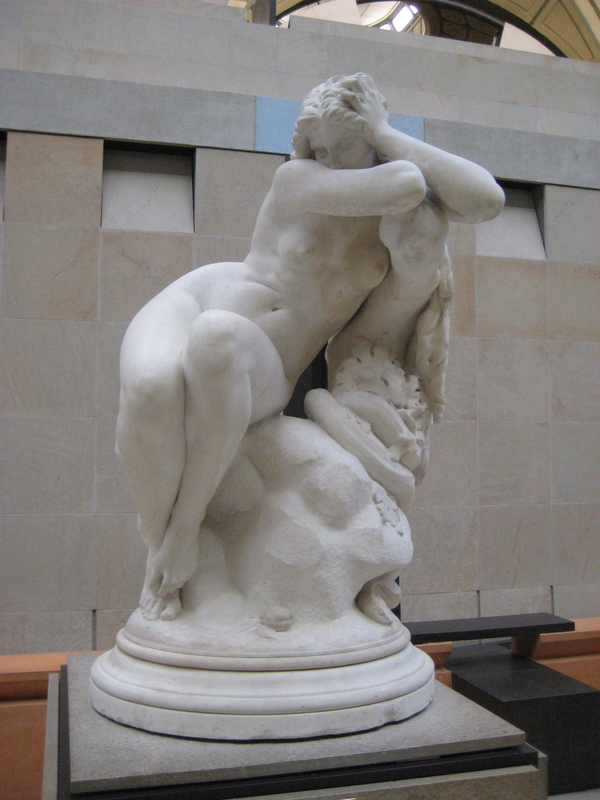 It was while piecing together my images of Eve that I found several photos I had taken of Eugène Delaplanche's (French, 1831-1892) work Eve After the Fall (1869). 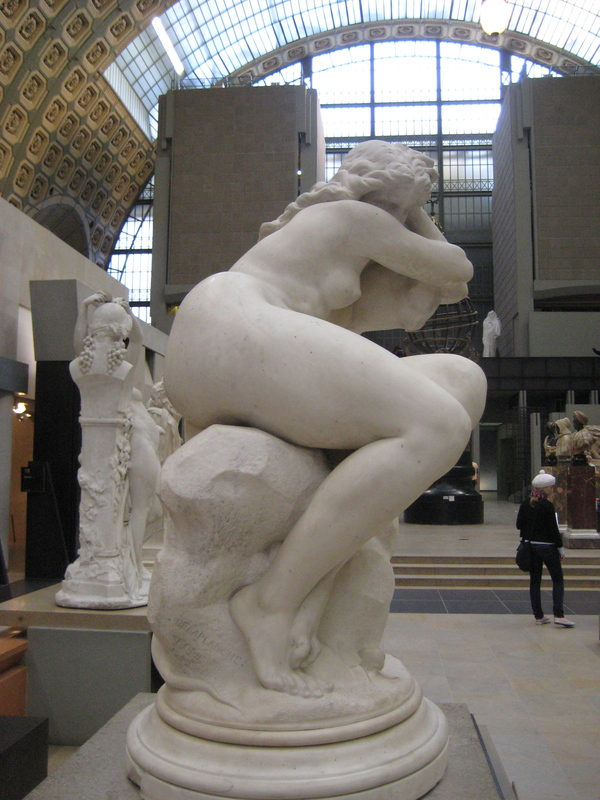 I will never forget the first time I saw it, years ago, at the Musée d'Orsay. Although I was familiar with Eve's eating of the forbidden fruit and her subsequent expulsion from Eden, I had never considered her feelings and, especially, the moment of realization she must have had after eating the Forbidden Fruit. The sculpture filled me with sympathy for Eve and remorse for my own bad decisions in life. Only great art can do that. Delaplanche studied under the neoclassical sculptor Francisque Joseph Duret (French, 1804-1865) . In 1864, Delaplanche was awarded the Prix de Rome and, subsequently, went to Italy where he studied Greco-Roman works and the sculptures of Michaelangelo and Bernini. He returned to Paris with an approach his work that combined classical idealism with natural forms. 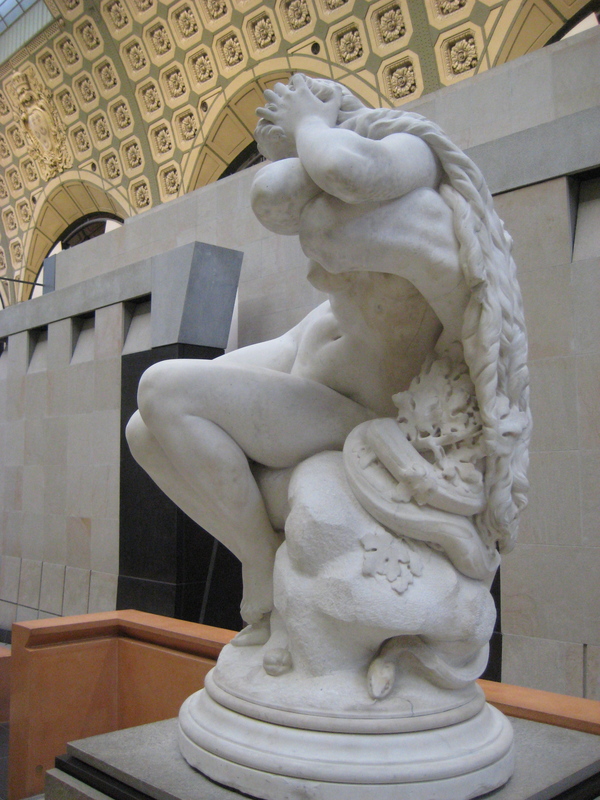 The result in Eve After the Fall (1869), done shortly after returning from Rome, is almost Hellenistic, but much larger in scale than most Greek statues. Eve is beautiful, yet forceful. Her features are idealized, yet her figure, almost drawn into a fetal position from horror, is sinuous, organic. All of the elements of the story are here: the discarded, bitten fruit from the Tree o Life, the serpent coiled around the tree, and Eve, full of horror and realization of her transgression. Delaplanche went on to do a number of works and recieved a number of prizes. Unfortunately, like many of his contemporary sculptors and unlike many contemporary painters, little has been written about his work and life.